The first devices powered by this 64-bit Tegra K1 chip will launch later this year and will be capable to offer "PC-class performance," promises NVIDIA. NVIDIA Tegra K1 has been around long enough to prove that it can easily surpass any other ARM SoC in GPU benchmarks, according to multiple reviews. 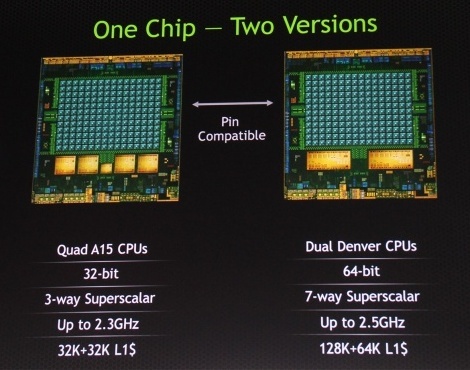 Now the company unveils more details of the 64-bit NVIDIA Tegra K1 chip, which is also known as "Project Denver." Denver is fully pin compatible with the existing NVIDIA Tegra K1 chips for easier implementation and shortened time to market. According to NVIDIA's official blog post, "the 64-bit Tegra K1 is the world’s first 64-bit ARM processor for Android, and completely outpaces other ARM-based mobile processors." 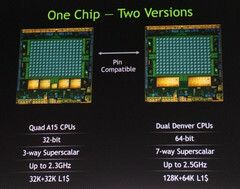 NVIDIA Tegra K1 Denver pairs the 192-core Kepler GPU with a dual-core ARMv8-compatible processor. Each of these two cores can execute up to 7 concurrent operations per clock and feature 128 KB L1 instruction cache and 64 KB L1 data cache. The chip also has 2 MB of L2 cache which is used by both cores. The first devices powered by this new chip will launch "later this year" and NVIDIA also promises they will be loaded with Android L.